Everyone has a time in their life when the world and its problems seem overwhelming. So many things pulling you in so many different directions that you lose sight of one's self and your power to manage it all. My daughter went through such a time. 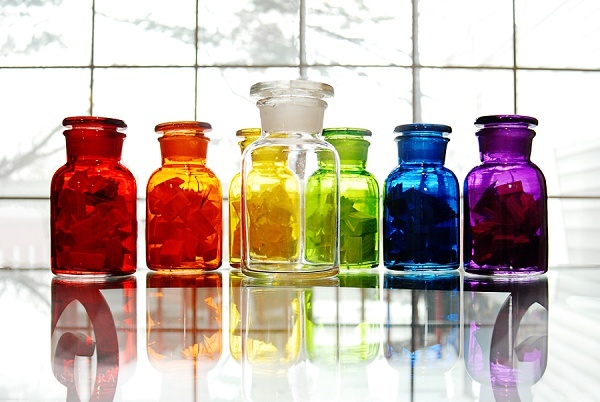 One of the best things we discovered in helping her cope with great difficulties was the beautiful rainbow jars. Take small pieces of paper and write down all the problems and worries you have. Put them in a jar and close the lid. Then, simply take one out at a time and only think about and deal with that one issue at a time. The rest do not matter in that moment. It allows you to focus, prioritize and manage it all. Next, gather a collection of colorful jars. In them, gather pieces with all your favorite quotes, bible verses, messages from friends and the like. When you need a bit of inspiration, a kind word or a bit of hope, they are there. When you compare the two, no matter how big problems may seem, they pale in the beautiful light of love, hope and friendship.